The Peerless-AV Short Throw Projector Mounts provide installation flexibility for single stud or double stud applications. 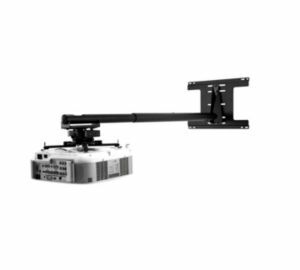 The universal telescoping arm is easily adjustable to accommodate various short throw projector distance requirements and the PSTK series also provides up to 6" (152mm) of lateral adjustment for perfect projector placement. Complementary to the universal design of the short throw projector arm, this comprehensive package comes with Peerless-AVs Universal Precision Gear Projector Mount that makes image alignment as simple as a turn of a knob. To tie it all together, the internal cable management system provides a clean clutter-free solution.